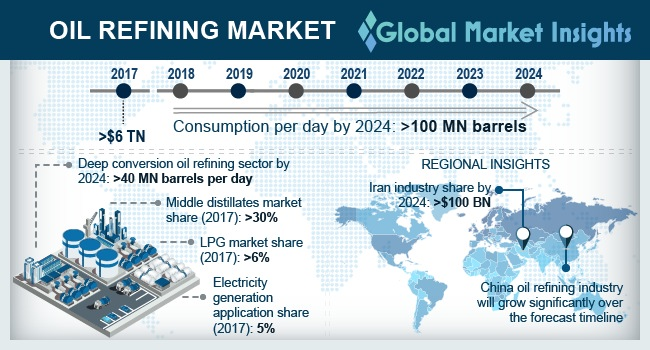 Oil Refining Market size will surpass USD 7 Trillion by 2024, as reported in the latest study by Global Market Insights, Inc. Growing demand for lighter petroleum products along with introduction of several air borne emission regulations will drive the oil refining market share. In Europe, MARPOL introduced International regulatory regime to limit the air borne emission from ships. According to the regulation from 1st January 2015, the maximum sulfur content in marine fuels within emission control area is to be restricted at 0.10% by weight. Rapid urbanization and sturdy investment toward industrial sector along with rising disposable income across developing region are some of the factors influencing the demand for light distillates. Increasing investment toward the refurbishment, upgradation and expansion of existing refinery facilities will propel the oil refining market growth. In April 2018, Saudi Aramco announced an investment of USD 44 billion to construct integrated refinery and petrochemical complex in India. Rising concern to reduce the dependency on import of petroleum product will further escalate the industry share. Kuwait oil refining market in 2017 was estimated to consume over 0.5 MBPD. Growing adoption of petroleum fired electricity generation facilities along with increasing investment toward upgradation and integration of existing refineries will nourish the industry growth. For instance, Kuwait announced an investment worth USD 17 billion to upgrade and integrate the Mina Al-Ahmadi and Mina Abdullah refineries. Ability to reduce the fabrication of residual fuels will augment the conversion oil refining market size. Higher yield of transportation fuels and the potential to process sour crude oil are few imperative features positively influencing the overall business outlook. Aviation application is predicted to witness robust growth on account of introduction of new regional connectivity schemes coupled with lowering cost of travel and upsurge in middle income passengers. For instance, in 2018 the aviation industry witnessed an increase in overall passenger revenues by USD 49 Billion when compared to the revenues in 2017. In 2017, road transport accounted for over 40% of the overall oil refining market size. Upsurge in demand for freight activity along with positive outlook toward tourism sector will augment the industry growth. In 2017, according to European Automobile Manufacturer Association road transport accounted for over 75% of all goods transported over land. Saudi Arabia oil refining market is anticipated to value over USD 150 Billion by 2024. Increasing focus to achieve diversified economic growth and employment opportunity will complement the business outlook. Rising population, improving living standards and economic growth are some of the factors responsible for encouraging petroleum product demand across the nation. Growing demand to process heavy crude and fuel oil into light distillates will further boost the industry size. Rising concern to curb import dependency along with growing demand for high value added refined products will propel the Indonesia oil refining market share. For instance, in 2017, fuel demand in Indonesia reached 1.6 barrels per day however the refining capacity was around 1.1 MBPD which in turns indicates that country imported 43% of products from abroad. Major industry participants across the oil refining market include S-Oil, Saudi Aramco, ADNOC, PBF Energy, Reliance, Indian Oil, Hindustan Petroleum, BP, Exxon Mobil, Bharat Petroleum, Fluor, SINOPEC, Shell, Phillips 66, Kuwait Petroleum and Chevron.